Billy Bostock (Forward/midfield/full back, 1967-74) – Inverkeithing lad Billy Bostock came to Cowden from Jubilee Athletic in 1967. The Divotonian quickly showed that he was a natural born striker. In season 1968/69, he was at his peak notching 23 League goals. 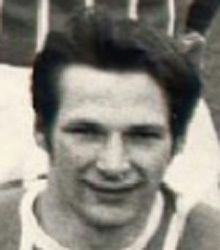 The following year Cowden won promotion with strikers Dickson, Mullen and Bostock grabbing 61 League goals between them. Billy found it more difficult to gain a striking berth in the top flight but showed his versatility as a most effective full-back or in midfield or even on the wing. Towards the end of the campaign though his old scoring touch returned and he was then once more top scorer in 1971/72 – a season in which he was the club’s player of the year. In 1973/74, he was plagued by injury and was freed after claiming a post-war record of 72 League goals for Cowden. Bustling Billy then played on for 7 years with Lochgelly Albert (often as captain of the side). He died in 1996 aged only 51 – his gravestone at Hillend carries a footballer logo and his nickname ‘Billy B’.